Allah (SWT) has given us innumerable blessings. No matter how hard we try, no matter how much time we take, there is no way to count all the blessings. To illustrate this, we created a gratitude basket, in order to see it overflow. My goal was to come up with enough things for which we are grateful that our basket filled up and the balls spilled out. I thought this would be a good activity to do as a group, the larger the better. We used colorful balls, and our basket was trashcan-sized. You could do this activity with candy or marbles, and then you might prefer to use a smaller jar. For a larger group, you could use a cardboard box, to have room for everyone’s ideas. Give each person a pile or bag of whatever item you choose – in our case, balls. 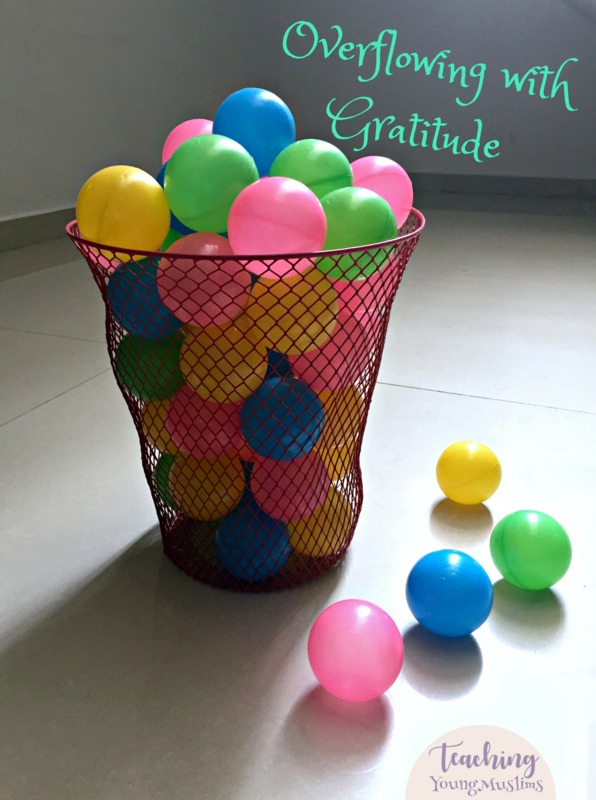 After choosing what they are grateful for, each person puts one ball in the basket. Keep going until the basket is overflowing. As the balls start spilling out of the basket, discuss how you could keep coming up with more blessings that we have been given by Allah (SWT) and that we should be grateful for. Even though we came up with so many ideas already and the basket is full, if we kept thinking, our list would never end. How easy/difficult was it to come up with enough ideas to overflow your basket? I’d love to know – leave me a comment below!